The best-selling compact crossover-SUV enters its fourth generation with updated style and functionality while holding its Recreational Activity Vehicle roots. The first thing you’ll notice about the new 2013 Toyota RAV4 is that the rear-mounted spare tire is gone. One of the chief customer complaints about the previous-generation RAV4, says Jim Colon, Toyota’s VP of Toyota Product Communications, was that the rear tire hampered visibility and that consumers prefer a lift gate to a swing-out tailgate. Removing the tire also improved aerodynamics for better economy as well. Goings hands-on, other dramatic changes are also noticeable. 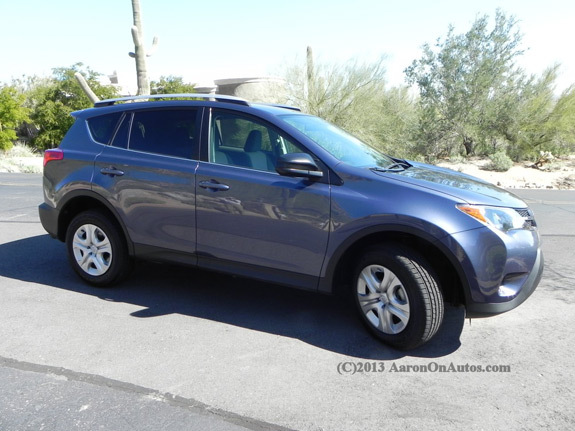 The 2013 RAV4s style is focused on an updated, more modern look with better airflow and improved handling. A high belt line is accentuated by a long, straight indent from the back of the front fender, along the doors to the top of the rear tail lamp, giving a hint at speed while the lightly flared fenders evoke a feeling of strength. The more rounded, pointed nose follows the Toyota lineup in current design cues and the low, sloped windscreen and shorter greenhouse give the RAV4 a more modern appeal. Knowing its target market, Toyota also updated the wheel options for the new RAV4. The base model (LE) comes equipped with standard steel rims that have been powder coated to give them a more upscale, alloy look that will be much-appreciated given the low-end market’s continued use of plastic covers. The XLE and Limited models will have alloy options with the Limited having a great-looking bisected spoke alloy wheel that is one inch larger than the other two trim levels. The changes to the 2013 RAV4’s interior will be a shakeup to the crossover market. Even the base model RAV4 now has a two-tone, soft touch interior – something usually only seen on luxury models. This adds to the visual appeal and the feel of roominess that the crossover has. For the premium model, leather has been replaced with SofTex, which is a more durable and environmentally-friendly leather-like material. Sitting on and feeling it, most will not know the difference, but when you spill your coffee on it.. you’ll notice. Leather still adorns the premium model’s shifter and accessories. 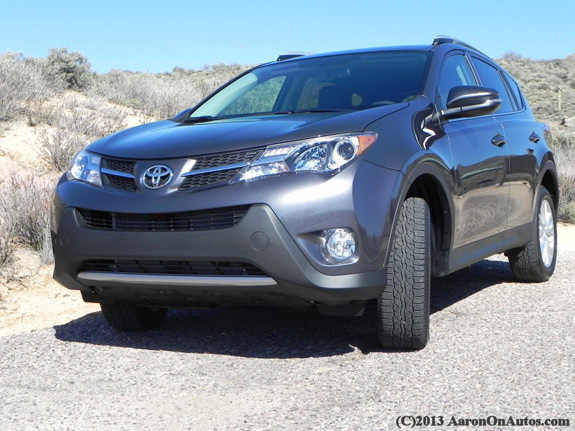 Despite being somewhat smaller, the 2013 Toyota RAV4 has a larger feel to its interior. Rear legroom was sacrificed somewhat to accommodate more room in the driver’s and front passenger’s area, but all but the tallest will not likely notice. The new roofline would have meant less headroom, but the lower floor and better seating arrangement makes up for it. Rear cargo space is excellent and with the rear seats folded, a class-leading 73.4 cubic feet of cargo area becomes available. An acoustic windshield is standard on all models, going a long way towards improving interior cabin noise. When given a chance to compare this by driving a previous-generation RAV4, the difference was remarkable. Those who enjoy their stereo will appreciate this addition. Sound absorption was a big focus on the new interior design and it is very noticeable. Toyota dropped the underselling V6 engine from the RAV4 line. With less than 5% of consumers opting for the larger, less efficient engine and thanks to the improved power output of the smaller 4-cylinder engines it has, Toyota decided to offer just one powerplant across all trim models. This was a good choice and few will miss the larger engine. The new 2.5-liter dual overhead cam (DOHC), 16-valve, 4-cylinder engine sports Dual VVT-i (variable valve timing, intelligent) to put out 176 horsepower and 172 lb-ft of torque. Even without direct injection or turbocharging, this engine puts out more than enough muscle to give the new RAV4 a very responsive feel on the road. DIY mechanics will appreciate the way Toyota continues to focus on accessibility for routine maintenance. The engine mates with a 6-speed automatic transmission in a front-wheel-drive configuration. The all-wheel-drive (AWD) option is available on all trim levels for an additional $1,400, moving to a 60:40 power split front:rear. With two more gears than before and therefore better gearing ratios, the 2013 RAV4 is not only markedly more efficient, but it’s also much smoother in acceleration. This is aided by the Flex Start torque converter in the transmission, which locks gears quickly under heavier demand – such as with hard acceleration. Drivers will immediately notice this in Sport Mode. 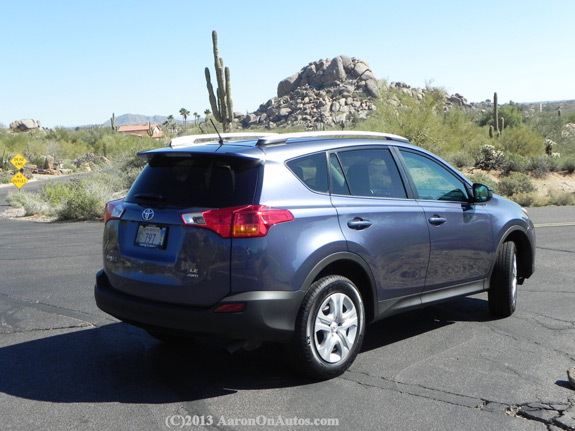 All trim levels of the 2013 RAV4 include both Eco and Sport modes. Eco Mode reduces the response rate of the climate controls and increases the “play” in the accelerator to smooth out engine revs. Sport Mode engages a more dynamic, responsive drive that most will immediately appreciate. Despite my large frame, the interior of the RAV4 is very comfortable and the improved buckets are a far cry from the previous-generation’s cramped seating. The crossover is extremely responsive and the sporty feel of its movements belies its tiny engine and offroad stance. The RAV4 accelerates, stops, and maneuvers very well for its segment and is one of the more fun crossovers of this size that you’ll drive. In Eco Mode, this changes to a more sedate, everyday cruising feel, which some might enjoy – especially with the improved fuel economy it brings. The vehicle has just the right amount of versatility and small size to please even small families with plenty of room for car seats, camping gear, or whatever it is you’re into. As a father of two toddlers, I can appreciate the versatile amount of space offered. The trim levels are well-suited for today’s buyers. The base model LE starts at $23,300 (plus destination) and has a respectable amount of goodies, including a nice-sounding 6-speaker stereo with base CD and satellite built-in. The XLE trim level starts at $24,290 (plus destination) and offers a more connected radio. Toyota believes that this trim will make up the bulk of its sales. At just over $27,000, the Limited trim offers a much more plush interior with beautiful two-tone color options, an 8- or 12-speaker audio system with navigation and connectivity, USB ports, etc. Owners will also appreciate that all new RAV4s include two years of standard Toyota maintenance at no additional cost, and that car insurance for the RAV4 is relatively cheap. With its great new look and very fun driving experience, the 2013 Toyota RAV4 will continue holding its top spot in the small crossover segment.